Queensland College of Art (QCA) Master of Visual Art student Michael Phillips has won a commission to create an epic 90 metre floor to ceiling art work for the expansion of Brisbane Airport’s International Terminal northern departures concourse. More than 100 entries were received, with five finalists considered for the major prize. The four runners up each received $5000 prize money and the winner received $20,000. BAC also covers the cost of the production of the art work. Installation of Mr Phillips’ work is the final element of the $73 million project to add an extra 11,000 square metres of space, more boarding and dwell zones, plus four new aerobridges and four new walk out gates to the International Terminal. Julieanne Alroe, Brisbane Airport Corporation (BAC) CEO and Managing Director, said the idea behind the art prize was about encouraging local talent and providing a unique opportunity and space for artists to create a significant public work. “Brisbane Airport is home to one of Australia’s largest collections of public art and this commission is another chapter in our long-term commitment to the arts and supporting local artists,” Ms Alroe said. Mr Phillips’ winning design was chosen by an expert panel, which included Museum of Brisbane Director, Renai Grace, the Co-Directors of the Institute of Modern Art, Aileen Burns and Johan Lundh, as well as Ms Alroe and BAC’s Head of Corporate Relations, Rachel Crowley. “The finalist entries were beyond our wildest expectations and a wonderful statement on the range, skill and ambition of our emerging artists. 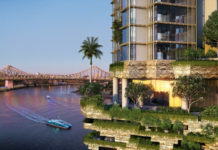 Michael’s entry will be a superb addition to BNE’s public art collection,” Ms Alroe said. Mr Phillips created his striking work in the QCA workshops at South Bank, making a series of wood block prints that were blown up and digitally printed onto vinyl panels. The Master of Visual Art student said the work was inspired by the idea of the airport as a melting pot of different cultures and languages. “Airports are really vibrant places,” he said. “You get this incredible mix of people of all ages and cultural backgrounds. Mr Phillips said the commission was “a fantastic opportunity”. 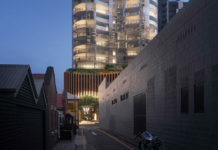 Queensland College of Art Director Professor Derrick Cherrie said the project offered students a chance to test their work in an industry setting. “It is a really exciting opportunity for Michael to have his work exhibited on a large scale, and for him, this is a career-defining moment,” he said. Professor Cherrie said public art was an important part of contemporary art practice. “Many of our students will go on to work in the public art sphere, and this project gave them a chance to test their ideas with a real client, and make work that was vigorous, exciting and accessible,” he said. The mural was installed in the first week of February with passengers being able to view the work in the coming weeks when the International Terminal Northern Concourse expansion is officially opened. The new installation will complement the 750 metre long ‘Sensory Hug’ by the late Mrs Sally Gabori and the ‘Keep the Sunshine’ artwork by Sebastian Moody both of which are at the International Terminal.